Come for a celebration of Mediterranean Summer! Join our Roman Carnival of merry-making, feasting and flowing libations! Roman attire is encouraged! 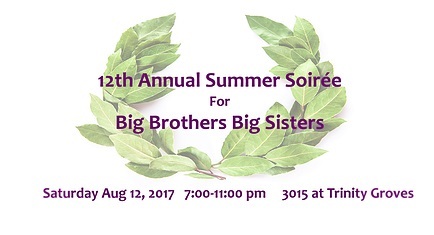 The 12th Annual Summer Soiree is joyfully presented as a community service effort of Northwestern University’s Kellogg Alumni Club of DFW and Northwestern University’s Alumni Club of DFW in support of the mission of Big Brothers Big Sisters in Greater Dallas. Our purpose is to raise funds and attract volunteers to Big Brothers Big Sisters while partying and networking with 250 friends and Dallas business elite. Enjoy the open bar and sumptuous appetizers, buffet style dinner and dessert prepared by Chef Sharon van Meter, W.M.C.S at her signature venue, 3015 at Trinity Groves. Then, be prepared to hit the dance floor with Dallas DJ Jeff Mitchell, the Founder of Decks in The Park, the must-do party series of high summer in Dallas. Jeff has played along with some of the biggest names in the dance music industry and for celebrities like Dirk Nowitzki. There will be a silent auction featuring several one-of-a-kind excursion packages and other experience items. Come join the fun on Saturday, August 12, 2017 from 7p to 11p. There will be an after party for those who want to continue partying into the wee hours of the night. Currently, we are providing a discounted ticket price of $100 for the first 100 tickets sold. Take advantage of this awesome deal and join us for the social event of the year! To purchase tickets, visit our website at www.kelloggsummersoiree.org and select the “Buy tickets” button at the top of the home page.